Ausgelassen, a German word, means hilarious and passionate. Inspired by its meanings, Ausgelassen Harmonica Quartet (AHQ) aims at promoting harmonica music in a hilarious and passionate way. Since its foundation, the Quartet has performed at various occasions both locally and internationally to promote the arts of harmonica music ceaselessly. AHQ’s members have participated in and performed at harmonica festivals in different places. 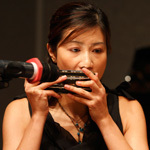 For example, its members joined the Hong Kong Harmonica Association to participate in the World Harmonica Festival in Trossingen, Germany (2005, 2009, 2013) as well as the Asia Pacific Harmonica Festival in Taipei (2006), Hangzhou (2008) and Singapore (2010). Other overseas performances were taken place in Macau, Shenzhen, Hangzhou, Chengdu, Singapore. In October 2010, AHQ performed during the ‘Hong Kong Week’ at World Expo 2010 Shanghai. AHQ has organized its first recital in October 2008 and delivered the premiere performance of Lau Chi-lung’s work “plum flower-orchid-chrysanthemum-bamboo”. From July 2011 onwards, AHQ co-organised Ausgelassen Harmonica Concert annually. Ausgelassen Harmonica Trio had also shared harmonica music on the TVB Jade programme “Cultural Plaza” over three consecutive Sundays in August 2012. In the same year, AHQ released its first album – hilarity.passion. Seto, Andy Wood-hung [B.A. (Hons. ), M.Phil., P.g.D.E., M.Sc., M.A., Ph.D. Candidate] has been teaching harmonica for over 20 years and vocal singing for over 5 years. He is actively involved in harmonica activities in Hong Kong and won numerous prizes in Hong Kong Schools Music Festival in the 1980s. 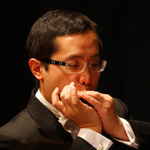 Currently, he is the Principal Second Chromatic Harmonica of the HKHA Harmonica Orchestra and a First Chromatic Harmonica of the Chinese YMCA Harmonica Orchestra. 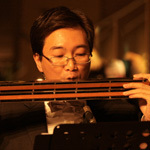 Lau Chi-lung [Amus TCL] is a full time harmonica instructor, arranger and Principal Double Bass player in Hong Kong North Philharmonic Orchestra. He is a committee member of Hong Kong Harmonica Association. She is the Concertmaster of Lyra Harmonica Unit and First Harmonica of Aurora Harmonica Trio. 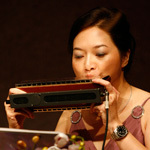 She is a committee member of Hong Kong Harmonica Association and member of the Chinese YMCA Harmonica Orchestra. Currently, she is the Concertmaster of Dim Sum Harmonica Club.